► LIBYA: Egyptair Express to go 4x weekly Alexandria - Benghazi from July. Egyptair Express (MSE) are to launch four weekly flights between Benghazi, Libya and Alexandria with effect from July 2. The flights will operate using an Embraer E170. ■ MOZAMBIQUE: Carlos Jeque elected Chairman of the Board at LAM. Reports via Radio Mozambique state that during a General Meeting of Mozambique’s publicly owned national carrier, LAM - Linhas Aéreas de Moçambique (TM) held yesterday in Maputo, Mr Carlos Jeque was appointed to the chairmanship of the board of Directors. ■ KENYA: Kenya Airways renegotiates its MRO contracts in bid to cut costs. Fresh from announcing its latest Financial Year results which entailed a USD92million loss, Kenya Airways (KQ) has announced further cost cutting measures aimed at returning the struggling carrier to the black within the next two years with news that it has renegotiated its aircraft MRO (Maintenance Repair Overhaul) contracts to its benefit. ■ TUNISIA: European Union, Tunisia set to conclude latest round of talks on Open Skies agreement. Negotiations between Tunisia and the European Union (EU) regarding a possible Open Skies agreement are set to come to an end today amid reports that Tunisia's Minister of Transport, Abdelkrim Harouni, believes that national carrier, Tunisair (TU), was no longer in any danger and could hold its own in an open market. Open skies is an air transport liberalization scheme in which any barriers of entry to participant countries’ airlines are reciprocally lifted as well as regulations on all forms of air transportation – cargo or passenger – within their sovereign borders. ■ SOUTH SUDAN: First batch of SSCAA managers undergo training in Turkey. Turkey has once more extended its hand to help develop the fledgling civil aviation bodies of nation states in the Horn of Africa, this time with a security training programme aimed at managers from the South Sudanese Civil Aviation Authority - SSCAA. The SSCAA was born in February this year. ■ NIGERIA: Abuja finalizes plans for new carrier "Nigeria One" as Aer Lingus refutes claims of leasing deal with government. The Nigerian Government , through its Aviation Ministry, has now completed plans to float a new national carrier to be named Nigeria One (not National One as previously reported). ■ THAILAND: Mozambique, Thailand hold talks on improving cooperation in civil aviation. Mozambique's Minister of Transport and Communications, Paulo Zucula, and Thailand’s Prime Minister Yingluck Shinawatra have met in Bangkok to discuss various issues pertaining to the development of civil aviation in the Southern African nation. ■ TANZANIA: TCAA awards ATC upgrade contracts to Germany's Comsoft. The Tanzanian Civil Aviation Authority (TCAA) has contracted German ATC contractors, Comsoft, to deliver two modern technologies in the fields of air navigation and communication equipment, in order to increase flight safety in the region. ■ TANZANIA: fastjet in talks with four other African carriers regarding possible tie-ups: Winter. On the back of recent investments in South Africa and Nigeria, fastjet (FN) is reportedly in negotiations with as many as four airlines over possible partnerships, as the struggling LCC attempts to spread its wings across the continent, albeit circuitously. ■ NIGERIA: Captain Fola Akikuotu appointed new Director General of the NCAA. The Nigerian Senate yesterday confirmed the appointment of Captain Fola Akikuotu as the new Director General of the Nigeria Civil Aviation Authority(NCAA). Captain Akikuotu takes over from interim DG, Joyce Nkemakolam, appointed in March. ■ GHANA: CACC hands over preliminary designs for new Accra International Airport to government. Ghanaian Minister of Transport, Ms Dzifa Attivor, says preliminary designs for Accra's new international airport have been presented to the Ghana Airports Company Limited. The project will be undertaken by the China Airports Construction Corporation (CACC) and is intended to transform Accra into a regional West African hub. ► NIGER: Air Niamey takes on its first A320; domestic ops in conjunction with Equaflight Niger to begin shortly. Air Niamey (A7) has taken delivery of its first of two Airbus A320-200s, (MCN 314 | ex-N389VL). The A320 was transferred from the US aircraft registry to the Nigerien one on June 19. ► DUBAI: Emirates outlines African routes to be affected by closure of DXB runway 12L/30R in 2014. ► KENYA: Jubba Airways (Kenya) gets its first B737-300. Jubba Airways Kenya (3J), the sister company of Somalia's Jubba Airways (6J), has taken delivery of its first B737-300 (MSN 27521 | 5Y-CCR), an ex Air Bishkek (KR) machine. ► TUNISIA: (Media) Syphax Airlines takes delivery of its first A330. Tunisian private carrier, Syphax Airlines (FS), has taken delivery of its first Airbus A330-200 (MCN 345 | F-WJKG) at a ceremony held on Friday in the Tunisian capital, Tunis. ■ KENYA: Gulf Energy planning to build new Fuel facility at Nairobi Wilson airport. Gulf Energy has announced plans to construct a USD250'000 (KAS20million) aircraft fuelling facility on land leased from the Kenyan Airports Authority at Nairobi Wilson Airport. ■ SOUTH AFRICA: FedEx buys out SupaSwift South Africa, Malawi, Mozambique, Swaziland and Zambia. FedEx, the American global courier delivery services company, says it has completed the first stage of a strategic acquisition by signing agreements to acquire the businesses operated by its current South African service provider, Supaswift (Pty) Ltd., in five countries in Southern Africa, including South Africa, Malawi, Mozambique, Swaziland and Zambia, and is also in discussions to acquire Supaswift’s businesses in Botswana and Namibia. These acquisitions will operate under the FedEx Express business unit and the transaction is subject to necessary regulatory approvals and customary closing conditions. ■ KENYA: Kenya Airways considers setting up own fuel hedging firm. Kenya Airways (KQ) is considering setting up a fuel procurement company as part of extensive measures aimed at stemming mounting losses incurred over the past two years. The Kenyan national carrier recently announced a USD92million loss for its 2012/13 Financial Year which it blamed on "harsh economic and geopolitical conditions" coupled with a global economic slowdown and volatile global oil prices. ■ ZIMBABWE: Air Zimbabwe readmitted to IATA after passing its IOSA. Air Zimbabwe (UM) has reportedly been readmitted to the International Air Travel Association's International Operational Safety Audit (IOSA) registry following the audit's completion in February. ■ SOUTH AFRICA: New SAA plan to be made public in late July/August as Ethiopian, Kenya Airways send out feelers. Monwabisi Kalawe has outlined his first steps taken as the new South African Airways (SA) boss stating that he was aiming for a late July/early August public announcement of his airline's tentative Turnaround Plan #9, currently undergoing South African Cabinet scrutiny. ► MALAWI: Air Malawi Ltd's lone ATR42, two 737s put up for sale by liquidator. Mr Lekani Katandula, a partner at audit and business advisory firm Deloitte, the officially appointed liquidators for the now defunct Air Malawi Ltd (QM), has announced that the airline's fleet of three aircraft, an ATR42, a B737-300 and a B737-500, are now up for sale to all interested parties. ■ ETHIOPIA: Location of new Addis Ababa international airport switched to Tagi. The site for the proposed replacement for Addis Ababa's Bole International Airport, set to outstrip its carrying capacity in the next five years, has been moved from Modjo, south-east of the capital, to the town of Tagi, roughly 30km west of Addis Ababa on the road to Jimma in the Oromia Special Zone. ■ CAMEROON: Camair-Co drops Lufthansa Technik as MRO provider; to drop the 737-700 citing lack of suitability. Camair-Co (QC), the Cameroonian national carrier, will not renew an MRO contract signed with Lufthansa Technik in 2011 after the airline cited a "unilateral increase in charges" as well as unjustifiable staff perks as its reasons. Airline CEO Matthijs Boertien claimed that spurned attempts to negotiate with the Germans had resulted in the impasse, thereby forcing Camair to look to Dutch outfit, Aviacare BV, for its future MRO needs. ► SOUTH AFRICA: SAA Cargo to retire its last 737-200F in late June. SAA Cargo, the cargo division of South African Airways (SA), are set to retire the last of their B737-200Fs, (MSN 22583 | ZS-SID), from revenue service with effect from June 25, it has emerged. 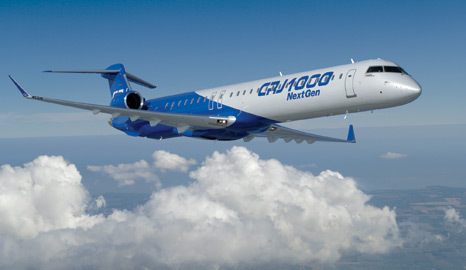 ► NIGERIA: Arik Air signs up for three CRJ1000s, four Q400s from Bombardier. Nigeria's largest carrier, Arik Air (W3), has signed a firm contract to acquire three CRJ1000 NextGen aircraft and four Q400 NextGen turboprop airliners from Canadian aircraft manufacturer, Bombardier. ► MOROCCO: Royal Air Maroc looking to acquire "20-30" Next Gen aircraft for fleet renewal. Morocco's national carrier, Royal Air Maroc (AT), is planning to immediately acquire between "20 and 30 NextGen aircraft, including 15 medium-haul and 5 long-haul jets", airline Chief Executive Officer, Mr Driss Benhima, has announced. ► NAMIBIA: Air Namibia commits to Intrepid Aviation for two A330s due in September and November. Air Namibia (SW) has announced its planned delivery schedule for its two new Airbus A330-200 aircraft, set to replace its ageing fleet of Airbus A340-300s on its Windhoek - Frankfurt, Germany route. ■ TANZANIA: Air Tanzania left hanging as big talking Omani consortium vanishes. Al Hayat Development and Investment Company, the big talking Omani outfit that earlier this year stated it was willing to invest USD100million (TSH160billion) into struggling airline, Air Tanzania (TC), has mysteriously vanished. The outfit had claimed that it was in the process of finalizing a Memorandum of Understanding (MoU) with the Tanzanian government at the end of January. ► TUNISIA: Syphax Airlines commits to the Airbus A320neo, A320ceo. Tunisia's Syphax Airlines (FS), has signed a memorandum of understanding (MoU) with Airbus to buy three A320neo. The order is the first time an African based carrier has ordered the NEO and marks a significant breakthrough for Airbus in one of the world’s fastest developing markets. ► NIGERIA: Saudia to drop Jeddah - Kano from September. Saudi Arabia's national carrier, Saudia (SV), will from September 1, 2013 cancel its twice weekly Jeddah – Kano service. The flight operates with a Boeing 747. ► GHANA: South African Airways to tentatively boost Accra to daily from August. According to AirlineRoute, South African Airways (SA) will from 7 August 2013 introduce a 7th weekly frequency on its Johannesburg – Accra route. The added service, which is still subject to government approval, will operate Wednesdays using an Airbus A330-200. ●● FRANCE: The African Aviation Tribune at the Paris Air Show 2013. Today (Monday June 15), The African Aviation Tribune will be at the Paris Air Show 2013 courtesy of ch-aviation GMBH. As such, postings over the next week will slow to a trickle, but be sure to follow us via our Twitter feed @AfrAviaTribune for updates and photos from the show as it happens. Expected this year are British Airways' A380, the new Airbus A350-900 and many more. Stay tuned for the pictorial post to follow as well! [UPDATE 19 JUNE] Well everyone, it seems the gods weren't smiling upon me this time round. A combination of bad Paris weather on my inbound fight that resulted in a diversion, coupled with a flat camera battery at the actual show meant i wasn't able to provide you with the updates (or pics) mentioned above. And i really do feel bummed about that. So, please accept my apologies on that and hopefully it'll come right next time round. The news feed should return to normal in the coming two days, so hang tight. ► MOZAMBIQUE: LAM eyes either B737-700s or A319s as part of fleet renewal's second phase. MEX - Moçambique Expresso, a subsidiary of Mozambique's national carrier, LAM - Linhas Aéreas de Moçambique (TM), says it has completed the first phase of its modernization through the recent acquisition of two Embraer ERJ145 in February and April of this year. ► ZIMBABWE: An A380 for Air Zimbabwe?